It's quite common for dogs and even cats to stumble across an edible cannabis stash. In some cases, small doses may simply lead to drowsiness and sleep. Although, if your pet has really gone to town, it might be time to pay the vet a visit. Psychoactive substances have a rich past within human history. Many different cultures all across the world seem to have held at least one type of psychoactive substance, from mushrooms and vines to booze and cacti, in high esteem. To this day, humans maintain a close relationship with altered states of consciousness, whether that be for personal development or addictive fulfilment. It’s interesting to note that humans are not alone in the quest for an altered state of consciousness. Many other animals in nature have been observed partaking in substance use. For example, elephants are known to get drunk from fermented fruits, and jaguars have been spotted chewing upon vines that seem to plunge them into a psychedelic state. One of the most commonly used psychoactive substances among humans is cannabis. The high, catalysed by the cannabinoid THC, provides recreational fun and medicinal relief for millions. It’s not clear whether other animals actively seek out this high, but when it comes to housepets, it’s quite clear that it’s not always safe to leave your edibles lying around. In contrast, some household pets seem to respond very well to medical cannabis when it comes to treating certain health conditions. So, when is it safe for pets to consume cannabis? And when should you be worried? There are numerous ways in which dogs can get high. Eating buds directly from a plant or dried stash may bring on these effects, and so can exposure to secondhand smoke. Dogs can also experience a potent high if they break into an edibles stash such as medicated brownies or butter. The latter is more dangerous in the case of dogs, as the high will be more powerful and prolonged, and the ingestion of chocolate can lead to vomiting, diarrhoea, and even internal bleeding and heart attack. Cannabis ingestion for dogs is very rarely fatal, with the minimum lethal oral dose being 3g/kg of bodyweight of THC. Small quantities are unlikely to elicit negative side effects, and some dog and cat owners openly give their pets leaves to consume with no ill side effects. In contrast, large doses can lead to numerous negative effects such as vomiting, tremors, agitation, and even seizures. Exposure to high doses can be classed as cannabis poisoning, and although deaths are rare, they have been reported after ingestion of concentrated medical-grade THC butter. The effect of cannabis on dogs has been studied. 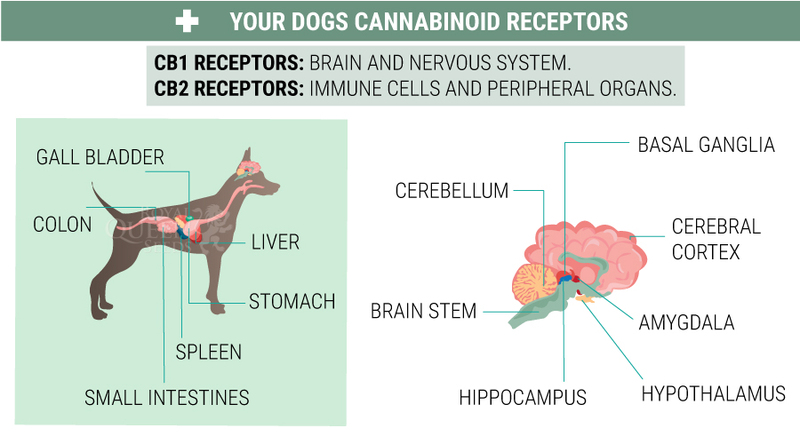 Dogs share a similar endocannabinoid system with humans. This system is comprised of two cannabinoid receptors, with the CB1 receptor found primarily within the central nervous system, and the CB2 receptor found within peripheral tissues. It is thought that CB1 is responsible for most of the effects seen in dogs after cannabis ingestion. After a dog is exposed to secondhand smoke, blood levels of THC rise rapidly, and effects will been seen shortly thereafter. If a dog has taken a chunk out of a cannabis edible, effects will typically be seen within 60 minutes after the event. Clinical signs of cannabis ingestion within dogs include depression, hypersalivation, pupil dilation, vomiting, urinary incontinence, tremors, hypothermia, and bradycardia (slower than normal heart rate). Higher doses of THC can result in different side effects including nystagmus (involuntary eye movement), agitation, tachypnea (abnormally rapid breathing), ataxia (a group of disorders that affect coordination, balance and speech), and seizures. WHAT TO DO IF YOUR DOG CONSUMES CANNABIS? If you suspect your dog has gotten into your edibles stash and had a small feast, the first port of call should be to call the pet poison helpline. The advisor may ask you for any visible symptoms that may signify the quantity that has been consumed. If it's suspected that a small amount has been eaten or passively inhaled, the advice may be as a simple as letting your dog rest and sleep off the effects. Alternatively, if your dog has consumed large amounts of edibles containing high concentrations of THC, the next course of action would be to go straight to the vet. Here, the clinician will take the first steps of obtaining and continually monitoring vital signs such as heart rate, heart rhythm, and temperature. There is no specific antidote to THC poisoning at this time. Drugs such as benzodiazepines may be administered to sedate a dog if it is severely hyperactive, distressed, and agitated. IV fluids may also be administered to help with vomiting and body temperature. Intralipid therapy has also been shown to reduce clinical symptoms as THC has a high binding affinity to fats. Although cannabis intoxication mostly affects dogs, with canines involved in 96% of cases, cats also experience this condition from time to time, making up 3% of cases. Cases of cannabis toxicity in cats also result from ingestion of cannabis products or exposure to smoke. Not as much is known about cannabis toxicity within cats. For example, the metabolic pathway is mostly unknown, as is the minimum lethal dose. The signs of cannabis intoxication in cats can vary, and are sometimes quite extreme. Symptoms include disorders of consciousness, coma, convulsions, ataxia, depression, agitation, anxiety, vocalisation, hypersalivation, diarrhoea, vomiting, bradycardia, tachycardia, hypothermia, and mydriasis. The route of action is the same as mentioned for dogs. Call the pet poison helpline for further advice based on symptoms. Some of the easiest ways to prevent your dog or cat from ingesting THC is by minimising and eliminating any potential exposure. Smoking in a different room and securely storing cannabis edibles and products will minimise access. If you are growing indoors, secure your grow room to prevent your pets from entering the space and potentially chowing down on leaves and flowers. If you are growing outdoors, you can take several steps to secure your garden, such as fencing. Not all cannabis exposure is bad for pets. In fact, there is a huge emerging market revolving around medicinal cannabis for pets. The presence of the endocannabinoid system within cats and dogs is why large accidental doses of THC can be potentially dangerous, and it's also the reason why cannabis is being used in attempts to treat ailments such as seizures. The non-psychoactive cannabinoid CBD is gaining traction within the world of pet medicine and supplements. Products are hitting the market that assist with fur health, anxiety, inflammation, nausea, and vomiting. Some pet owners are also using THC in attempt to treat much more serious health conditions. Not much is known about the exact effects of these molecules on pet health. Although they appear to have medicinal effects, there are dangers associated with inappropriate dosage. The best thing to do when looking to administer these medicines is to conduct your own research and have a conversation with your veterinarian.